A Prairie Fire is actually a cocktail: A shot of whiskey with hot sauce in it. OK, not much of a cocktail, but it’s an alcoholic beverage of some sort. 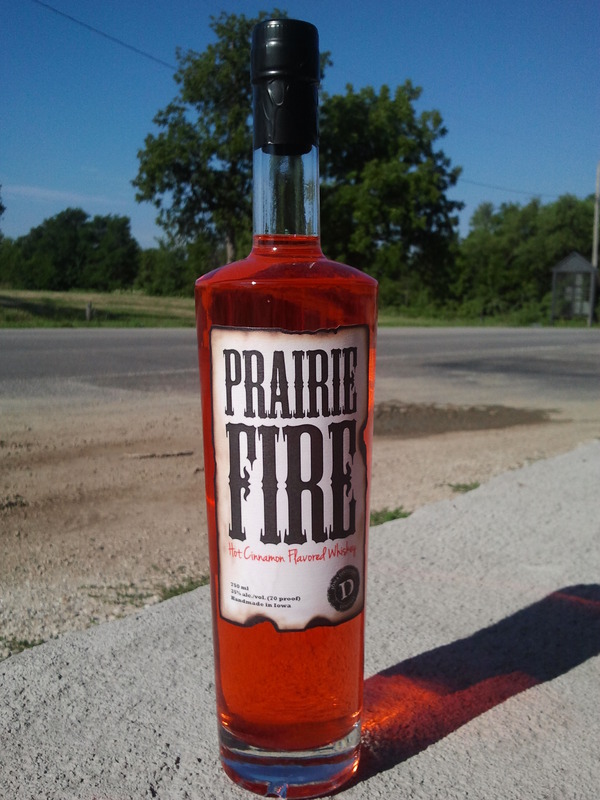 Prairie Fire, the bottled spirit, is made with this cocktail in mind. Eschewing hot sauce for cinnamon, this product from the Iowa Distilling Company wants you to feel the burn on your lips but not so much in your belly. The fact that it’s neon red in color — certified color added — only adds to the impression of burning. Hot stuff, to be sure. Grab your Chap-stick because the cinnamon sizzles as it hits your lips. The nose is bright and cinnamony, while the body offers a sort of cross between cinnamon toast and Hot Tamales. (In fact, the color may very well come from the same dye they use for the candy.) There’s not much else to say about Prairie Fire. It’s spicy and sweet and tastes just like a cinnamon spirit should. There’s not a whiff of whiskey to be found in it, but maybe that’s not such a terrible thing… though I would be curious to see what this would taste like with some actual whiskey character to it. Prairie Fire Whiskey is the best tasting whiskey I have ever had and it is good straight and also is excellent mixed with warmed up Apple Cider!! Please, let me know the location of your distillery so that I can have a tour when I am in your vicinity!! I enjoy doing P.R. Really got a good recipe there. I like it as well as the weaker,if not better.